Why be a Summer Day Camp Counselor? Get paid to play games with campers all day! Swim at Gibson Park pool weekly! 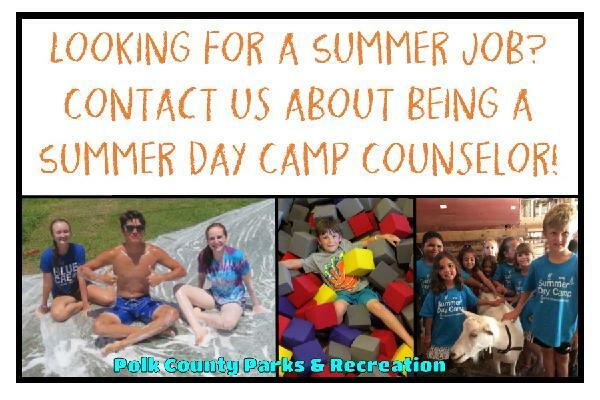 The Polk County Recreation Department is seeking seasonal help for the Summer Day Camp, which will last eleven weeks. Hours will vary, and may be up to 40/wk, if desired. Applicants must be enthusiastic and interactive. Duties will include, but are not limited to, supervising children ages 4-14, leading group games and crafts, completing daily chores, and other duties as assigned. Starting pay is $8.49/hr., and the minimum age for employment is 16. Applications are to be turned in to the County Manager.